We’re going to finish the leg off by rigging the foot and toe. Foot side view Zoom in on the right foot. The only parts that are left now for this leg are the foot and toe. We’re going to zoom through this part here. Switch to Modeling Mode and unlock the mesh that we locked earlier. 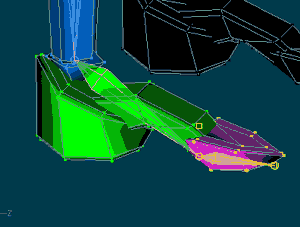 Then let’s go back to Bones Mode and zoom in on the right foot from the side (The [Left] view point). Create the foot bone as the child of the shin. This is a good position for it here. Create the foot bone as the child of the shin. Position the bone so that the tip of it rests in the back of the toe section closest to its bottom. Attach the bone to its parent “(GEO) Right Shin”. Use the Top view to make sure the the bone is centered along the foot. Check the bone from the [Top] view and adjust the bone to center it with foot. 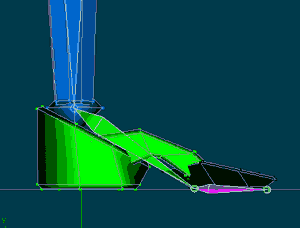 Now we are going to assign the foot’s geometry to the bone. You can shift click a CP on each section of the foot and then use the “Group Connected” option if you like. That approach is fine just like it was before but you will need to be careful to not accidentally select CPs from another area of the model that you don’t wish to assign to the bone. For instance, let’s say that we are looking a the foot from the side and we have not locked the CPs of the mesh that we are not interested in now. 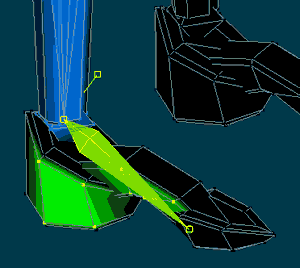 If we used a bounding box to select the mesh to be controlled by the foot bone in this view, the box would select both feet and the bone would control both parts of the mesh simultaneously. That is not what we want in this case. For this section of the mesh, I’ve rotated the view a bit and then used the Patch Group function to assign CPs to the bone. This time around, while the foot bone is active, I am going to use the Patch Group button in the Bones toolbar because it is the most convenient for me in this case. 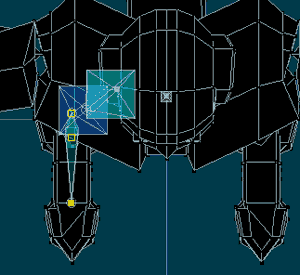 The Patch Group tool does not select all of the geometry within its selection area like the bounding box does. It will only select the CPs that make up the patch you click on. For that reason, I won’t bother to lock any of the model’s geometry this time. After exiting the Patch Group tool use the “Group Connected” command to get the rest of this foot automatically. 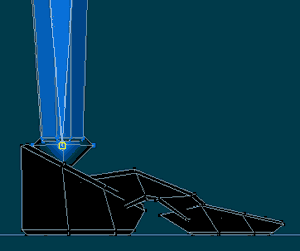 I’ll rotate the view some to avoid confusion anyway and then make sure the foot bone is selected. 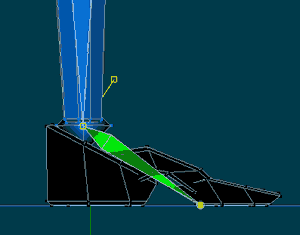 With the Patch Group tool I will select one patch from each part of the foot mesh. When I have made my selection I will Right-Click to exit Patch Group mode (make sure the foot bone is still selected) and then use the “Group Connected” command so that the all of the foot’s CP’s will fall under the foot bone’s control. The foot portion is now finished so we will do the toe next. Here is what your hierarchy should look like as of now. If you have not renamed your foot bone yet from its default name then do it now before we move to the toe. Create the toe bone as a child of the foot and attach it to the toe bone. Now its time for the toe. Create the bone as a child of the foot bone and extend the tip of the toe bone to the front most tip of the toe’s mesh. Just like we did with the foot bone, make sure that the toe bone is centered with the toe’s mesh. You can do this from the [Top] or [Bottom] view. Here the toe bone is done. 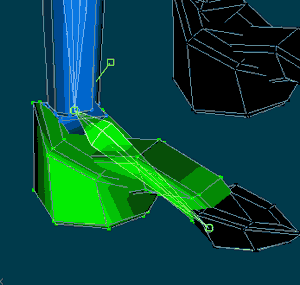 When you are satisfied with that then go ahead and assign the toe mesh to the bone using whichever method the you prefer in this situation (Remember to avoid accidentally selecting mesh other than the mesh of the right toe). Here is what the hierarchy in my PWS looks like now. Check your mesh assignments for mistakes and correct for any mistakes that you find. If you have not renamed your toe bone from the default already then go ahead and do it now. 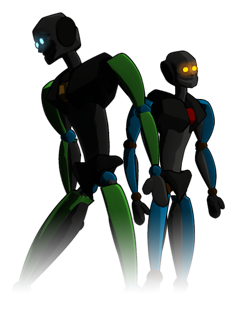 We have finished assigning the geometry bones to the right leg! In the next section we’ll check the results of our work so far in an Action window and we’ll make any adjustments if we find them necessary.